Etjen van der Vliet, owner of PETA award-winning catering company Just Like Your Mom, has always wanted to change the world. It’s an idealism he fostered over two decades as a full-time activist, living in large communities of squatters, supplying their meals and setting up mobile kitchens at direct action protests across Europe. But while his principles remain resolute, his approach has evolved with age. 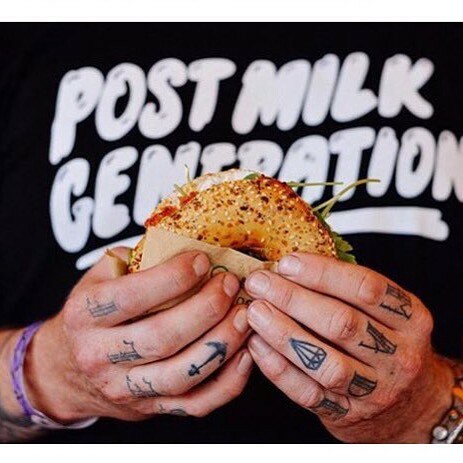 He still wants to affect change, but he’s not going to do it sitting in trees or squatting in buildings, instead he’s doing it one vegan chiliburger at a time; serving rock stars and festival-goers around the globe. There’s a certain level of irony in discussing the benefits of veganism and a life spent kicking against the establishment, when you’re sitting across a table in Starbucks, in the imposing shadow of a KFC and McDonalds. But like many people who pull off the motorway, we’ve chosen our meeting place (which Vliet succinctly describes as “capitalism at it’s worst”) for convenience rather than the moral aesthetics. And while it might not be to his taste, Vliet understands the functional value of roadside services like this. A pragmatism born through years spent crisscrossing Europe as an in-demand tour manager, working with The War On Drugs, Mac DeMarco, Matthew E. White, Strand of Oaks and many, many more artists. The tattoo across his knuckles reads “S.E.L.F.M.A.D.E”—a testament to a hard won career, which began in the Nineties while he was still living amongst militant anti-car owners. Back then Vliet was an anomaly, driving round in a beaten-up van, and soon friends (and friends of friends) who played in bands would come to him when they needed someone to haul equipment between gigs. In a few short years, this home-brewed endeavour became a runaway success and Just Like Your Mom began feeding headline acts backstage across Europe. His dissatisfaction with what was on offer to regular festivalgoers saw his food made a leap to the other side of the stage. And Just Like Your Mom is now a staple at events across mainland Europe, ranging from the Pitchfork Music Festival in Paris, Le Guess Who? Latitude, Best Kept Secret, Way Out West and even Milan Design Week. Lots of the people who work in my kitchen also play in bands, because money is always a problem for them,” he says. “It might make the world go round, but a lack of money can kill the creative process.” With very little label money being thrown around — much of which a band eventually has to pay back — there’s not much is left for young musicians to live on. Vliet has seen plenty of starving artists come and go in his time on the road and conservatively estimates that of the two hundred bands he’s worked with only fifty are still playing, and only three or four no longer struggle to pay their rent. So he does what he can to help. “I still believe that there’s a power in building communities together,” he says sipping his coffee.